'Beacon Towers', originally the Mrs. O.H.P. 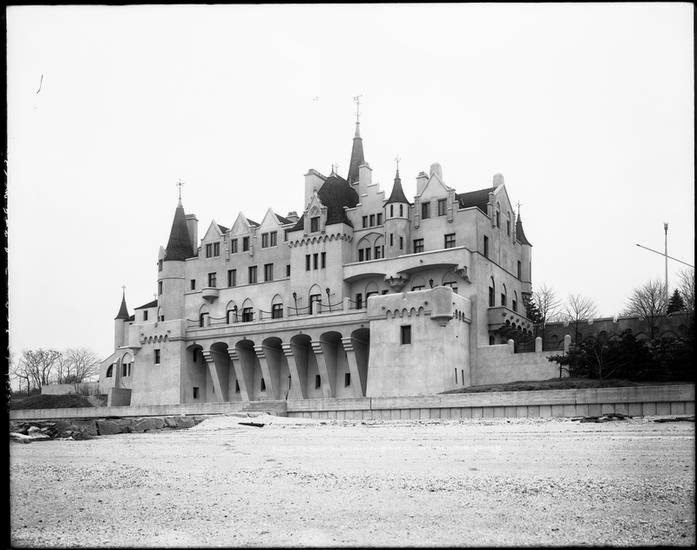 Belmont estate designed by Richard Howland Hunt c. 1917 in Sands Point and pictured here in 1931 under subsequent owner William Randolph Hearst. Click HERE and HERE for more on 'Beacon Towers'. Photo from the Museum of the City of New York. It is an astonishing house from any angle, but it must have positively taken a viewer's breath away when approached from the Sound. I wonder about the engineering of the whole thing- the foundation must have been a wonder in and of itself to keep the massive structure from shifting in the sandy soil. The Hearst additions and alterations, by the way, to my mind at least, detract from the sleek almost Deco-esque feel of the origional. The Hearsts may have needed more bedrooms, but the result was no improvement to the overall composition. I'll go on record to say that I rather like Hearst's goosed-up version of Beacon Towers ! more ducats at her disposal, with her penchant for building [and re-building], she might have gone in that direction at a later date; or even originally.